Making maple candy & cream at home is a fairly easy process, but extreme care must be taken because it involves very hot liquids. 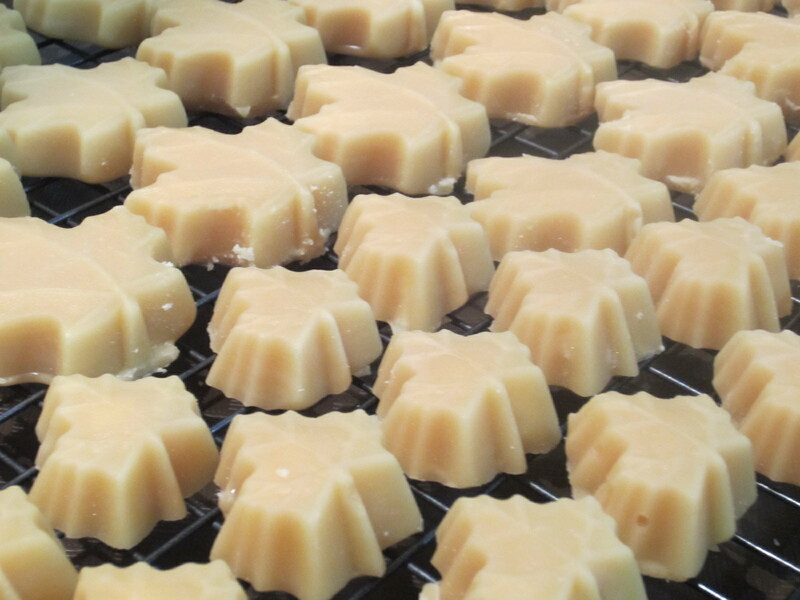 “Making Maple Candy & Cream,” a 10-minute instructional video showing how easy it is to make maple candy and maple cream is available from our store. It includes a full instruction manual and recipes. Pure maple syrup, Grade A Light Amber or Medium Amber works best. A quart (4 cups) will make 2 pounds of candy. 2. Deep cooking pot or pan. Candy thermometer (available at houseware stores) capable of measuring to 240F. Candy molds. Rubber molds work best, or lightly greased metal or wood molds. A few drops of butter or vegetable oil. Fill pan partially with water and the thermometer. Bring to a boil, and note the temperature of the boiling water. Empty the pan. Place syrup in pan; using a deep pan as the boiling syrup will foam up fairly high when boiling. Remove from heat, and let cool for 3-5 minutes. Stir evenly (don’t beat) until the liquid looses its gloss and starts to become opaque. This should take a few minutes, and is the tricky part to learn the exact correct moment to pour off. Stir too long and the thickened syrup will “set up” (harden) in the pan. If this happens, add a cup of water, and re-heat slowly to dissolve sugar, then start over. 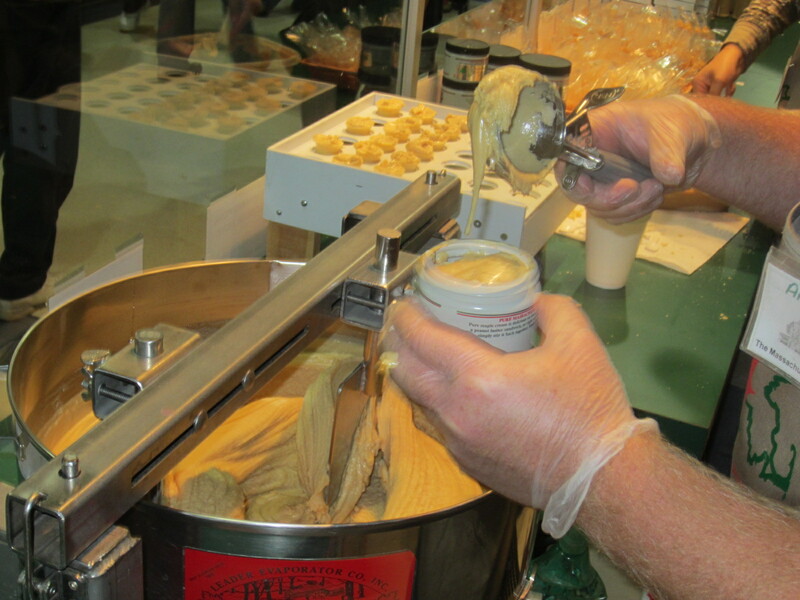 If you don’t stir long enough, the sugar may not “set up” in the molds at all. Pour carefully into molds. Small aluminum foil pans can be used. Allow to cool, remove from molds, place on a rack to dry for a few hours…enjoy! Pure maple syrup, Grade A Light Amber or Medium Amber works best. A quart (4 cups) will make 2 pounds of maple cream. Deep cooking pot or pan. Candy thermometer (available at houseware store) capable of measuring to 240F. A large pan or sink full of cold water. Remove from heat, and place immediately into a large pan or sink of very cold water to cool. Do not move, stir, or disturb the syrup during cooling. You can gently add some ice cubes to the water bath. Remove from water bath and stir slowly with a wooden spoon until it looses its gloss and starts to get opaque. You will notice a change in the color of the liquid. This will take a strong hand and some time. It will get to the consistency of peanut butter when finished. Spoon into containers and keep refrigerated. Lick all the utensils and enjoy.